Do we really need more exchanges? For anyone still sticking around the cryptocurrency business, sobriety is the new thing. Gone are the days of exultation and jubilation, when every man and his neighbor wanted to get rich quick in cryptocurrency. The bear market is already a year old this January and the masses which trooped to the cryptocurrency exchanges in the height of the Bitcoin run pre December 2018, dropped like flies, broken, angry, and defeated. But even with the year-long bear market, the total market capitalization at more than $200 Billion is still at an astronomical value that probably Satoshi Nakamoto, the inventor of Bitcoin has not even imagined. Currently, there are more than 2,000 different cryptocurrency tokens trading on 200+ different exchanges. Against this exciting but more sober backdrop, Coinvest is joining the fray with not one, but two exchanges designed to make investing much easier for the average folk. Anybody worth his trading salt can ask, with a smirk and a LOL, how different can it be for the exchanges born almost every week, heralding this and that functionality. And most of the time, this jaded observation would be a correct. Except this time, Coinvest is not aiming for the jaded traders and investors. Coinvest, a cryptocurrency wallet with a built-in decentralized investment trading market is already generating a buzz with its target market — investors with limited technical experience. Because this tweet by an experienced investor, Ariana Simpson, is still true most of the time. For the first time in the history of cryptocurrencies, an exchange is designed from the ground up, with the regular users in mind -not the institutional investors, nor the skilled traders who already know every MACD from RSI. By getting a wallet account on the Coinvest decentralized exchange, any user can buy a basket of assets in one single buy in an affordable, one price of $4.99. With Coinvest, users can trade directly from their Coinvest cryptocurrency wallet and invest in cryptonized assets and indexes using only the COIN token. The transactions will be denominated in COIN, which is the native cryptocurrency of Coinvest. While Coinvest is set to lead the way into a new era of simple trading, they are certainly not discounting the advanced traders. During the next decade, cryptocurrencies could easily become the most tradeable investment vehicle among all asset classes and it will continue to very attractive to investors. For this, they have the Coinvest Plus which is designed with advanced tools and an advanced order book matching system. As mentioned, there are currently 203 cryptocurrency exchanges available to the trading community. Let’s compare it to a few of the more popular cryptocurrency exchanges. Binance is a relatively young exchange, only founded in July 2017. Despite the fact that the exchange has only been in business for barely three years, it is one of the more popular exchanges among cryptocurrency traders. Traders can select from 419 markets on the Binance exchange and it is constantly at the top of the list in terms of daily trading volume. Binance does not allow trading on margin and all trading is conducted on a spot (cash) basis. Binance has a unique feature which separates Binance from other exchanges. It has its own native token, the Binance Coin (BNB). It has a total supply is $844M at the moment. The current price is $6.54 per token. In terms of popularity, Coinbase would be the most popular cryptocurrency exchange because of ease of fiat to crypto deposit. Many first-time cryptocurrency traders use Coinbase also because of its comparatively simple trading platform and account opening process. However, Coinbase is not designed for active and aggressive traders because the exchange does not offer low fees. Active traders require a low fee structure in order to successfully implement their trading approach. In fact, the fees are fairly high at 1.49% for all purchases and sales. Transactions involving credit cards will increase the fee to 3.99%. IDEX is the first Ethereum-based decentralized smart contract exchange that supports limit orders, market orders, gas-free cancels and the ability to fill several trades at once. It uses the maker fees and taker fees system. The market maker fee is 0.1%. The market taker fee is 0.2%. Traders pay the GAS fees to place their orders on the blockchain. It is not very user-friendly and users often complain about very slow order fills on trades and a rather long wait time for deposits to appear to accounts. The Coinvest exchanges have launched this January. It is one of the most innovative exchanges and is designed to solve many of the shortcomings associated with the exchanges listed above. How does Coinvest and Coinvest Plus Stack Up? Despite being popular, Binance is hard to understand for entry traders. Coinvest solves this problem by offering portfolio trading on Bitcoin, Ethereum, GUSD, BAT, and Litecoin. Binance and Coinvest both have native tokens. However, Coinvest has a simple and predictable fee of $4.99 for buying assets no matter how many assets you are trading. Coinbase is one of the oldest and more established cryptocurrency exchanges. The exchange is probably a good fit for new users who trade very infrequently. However, Coinbase would be a poor choice for new traders because the fees are relatively high at 1.49%. Coinbase would be not a good exchange for aggressive traders too. 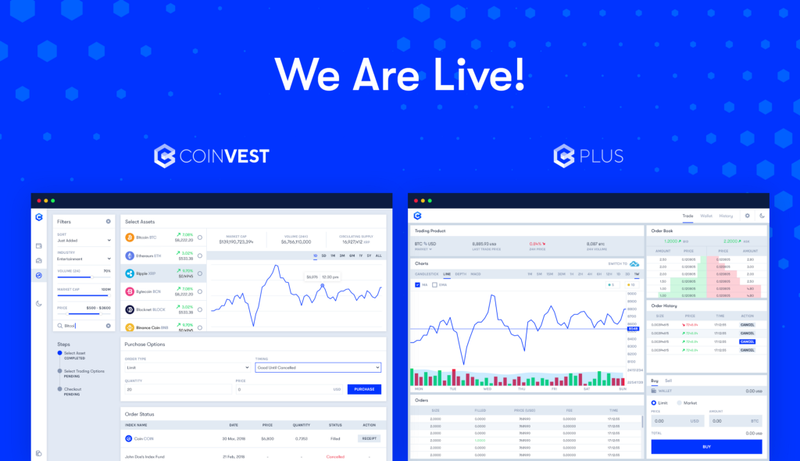 Coinvest Plus is clearly a better fit for aggressive traders due to its predictable fees of $4.99 and advanced user interface. Additionally, Coinvest has a one-click trading interface designed ease of execution. The IDEX Exchange is the first Ethereum-based decentralized smart contract exchange to support real-time trading. Coinvest is similar to IDEX based on the fact that Coinvest is also an Ethereum-based smart contract exchange. However, that’s where the similarities end. Coinvest has its own native cryptocurrency, the COIN token. IDEX does not have a native token. Additionally, Coinvest charges a simple and predictable fee of $4.99. IDEX charges a maker fee of 0.1% and a taker fee of 0.2%. IDEX traders are required to pay GAS fees to place their orders on the blockchain and Coinvest do not. Coinvest has began accepting new customers this January. The wallet has been open since December but upon launch, traders are now able to buy and sell assets like Bitcoin, Ethereum, Litecoin, GUSD, and BAT. If you want to be one of the first traders to use the Coinvest exchange, you can sign up now at wallet.coinve.st. Without question, there are several excellent cryptocurrency exchanges already available for crypto traders. It might have gone under the radar for most paid crypto influencers out there, mainly because marketing based on hype and FOMO is not an accepted principle for the company. However, Coinvest is clearly at the top of the list for those traders who are searching for easy trading with a predictable fee and a simple“Apple-esque” trading platform. Nam states “Coinvest is focused on building solutions for the next wave of opportunity in the blockchain industry. The future consists of converting all four major asset classes (stocks, bonds, currencies, and commodities) to tokenized securities.” Both the Coinvest and Coinvest Plus will be the foundational cornerstone of many different value-added financial services that Coinvest will provide for consumers in the future. Possibilities For The Next Wave Of Opportunity in The Blockchain Industry was originally published in Hacker Noon on Medium, where people are continuing the conversation by highlighting and responding to this story.